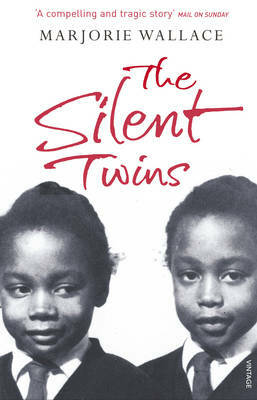 The Silent Twins is journalist Marjorie Wallace’s moving and compulsive true story about identical twins June and Jennifer Gibbons . From a young age, the twins refused to speak to anyone, including their parents and siblings. The reasons for their shared silence is never fully understood. Though the sisters did have a slight speech impairment, it did not explain why they would not even interact with those closest to them. For instance, while their family would be together watching TV, the twins would sit outside the living room watching the TV on the stairs. Their self-imposed exile is believed to be part of an unspoken pact between the two sisters, a pact that would manifest itself in a painful and violent struggle for identity, for an individual voice and ultimately for life itself. Wallace’s novel at times reads like a psychological case study but it is made personal by giving a much needed voice to the twins through the excerpts of their diaries and their short stories and poems. These reveal June and Jennifer to be exceptionally intelligent and talented writers, even managing to get their stories published. The twins are also very much aware of their social problems but sadly ill-equipped and at times too naive to deal with them adequately. Plus they’re caught up in their own struggle to break free of the other twin. This struggle forms a very dark, sinister and almost supernatural aspect to their story as the twins appear to have hold on the other which prevents them from being their own person. Attempts by educational psychologists to separate the twins in a bid to force them to mix with others, resulted in the twins becoming further withdrawn into a catatonic state. Eventually, when the girls leave school they are left to their own devices which later leads to their downfall. A series of teenage pranks take destructive turn towards petty crime and before long the twins are arrested on charges of arson and theft. Unable to explain their behaviour much less defend it the girls were sentenced to be detained indefinitely at Broadmoor Prison Hospital, on the grounds that the twins’ were psychopaths. They were just nineteen years old. I would agree that the the girls’ were suffering from some sort of mental illness, but as the author is at pains to point out, the girls were not psychopaths. Instead you can see that they were so badly let down by a system that should have assisted and to some degree protected them but instead boxed them up and labelled them and stored them away. Such was and, still is the misconception that surrounds mental illness, especially when the sufferer is a person of colour. Not only that, I think personally, that as much as their parents were very loving, kind people, they also played their part in being complicit with their daughters’ silence by barely acknowledging it and pretending that all was well and normal. Not once do they challenge their daughters’ behaviour, so strong is their desire to blend or to fit into their community and not stand out. Again this failure on the parents part allows the girls to continue in their own way. It also makes me wonder about how mental illness is addressed in black families. ‘Not telling your business to people’ may be a way of preventing gossip about your life but it can have devastating effects, as keeping things locked up inside of you for so long can fracture, if not completely break a person. The Silent Twins is a fascinating study which leaves you with many questions but overall my feeling coming to the end was of real sadness as I got a real sense of who these young women could have and should have been. Posted on 27 February 2012 27 February 2012 by queenpea77Posted in ReviewsTagged Black-British lit, Non-fiction, psychology.